At the bottom of the photo, you can see a player’s hand cart which has yet to be upgraded. When it is, the upgrade tile fills-up part of the missing piece. 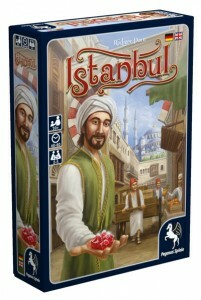 Istanbul is one of the games nominated for Spiel des Jahres Kennerspiel 2014 (the German complex game of the year) and is designed by Rüdiger Dorn who has designed a wealth of games. The game is a race to be the first to collect 5 gems with an interesting core game mechanic and a surprisingly dense amount of decision-making. The board is made up of a 4×4 grid of locations (large tiles) and each player starts with a stack of wooden discs which are their merchant and assistants (with the merchant always on top). Players take turns moving their merchant (and any assistants currently underneath it) so they can use the actions of the location tiles. When a player moves to a location that does not contain one of their assistants, they remove an assistant from their stack, place it on the location, and then take the location’s action. When a player moves to a location that does contain one of their assistants, they add it to the bottom of the stack, and then take the location’s action. If a merchant moves on his own (without assistants) and lands on a location without assistants, then he can not take the location’s action. So, players already need to work out which locations to visit, in what order, and how to do this by dropping off and picking up assistants along the way. The actions at each location are varied allowing players to gain goods (which come in 4 colours), gain money, buy gems, upgrade their cart, gain special abilities, gain special cards, etc. One location allows the player to gather up any assistants that are elsewhere on the board and place them under their merchant. Each player has a handcart (a small player board – see photo above) to carry their goods. When you gain red, green or yellow goods, you fill up your cart to the maximum of that colour you can carry (blue goods are slightly harder to gain). Players carts show the maximum of each good they can carry, but upgrading your cart adds more slots on which to carry goods. Physically, this is handled by slotting an extra row of goods capacity icons (a small tile) into one of the spaces on your cart (a large tile) which is a nice game mechanic and also tactile and simple. Whilst there’re lots of things you can do on the board, the race is to collect gems and these can be gained in several ways. Some can be bought for goods, some for cash, some are gained when you gain certain special abilities, and if you fully upgrade your cart. Players’ actions can affect others by altering the specifics of an action – for example, when a gem is bought for cash (or goods), the price for the next one is higher; the mixture of goods that can be sold at a market changes each time someone sells there; and, the goods gained at one location change slightly each time the location is used. Also, a player must pay each other player who is already on a location they move to; otherwise, they can not use that location’s action. As a result, player interaction is indirect but can still have impact. Having an idea as to what a player is trying to achieve can make a difference to the order in which you perform your actions, whether it’s to make sure they won’t affect you, or just so you can try to affect them. There are a few other game mechanics in the game too, such as the family member token which you can send to perform an action anywhere on the board, the smuggler and governor tokens who can give you a good or bonus card if you perform an action where they are and then move to a new location, and so on. The game ends when one player has 5 gems (6 in a 2-player game) but players finish the round so everyone has an equal number of turns. The player with 5 gems wins (and there’re a few tie-breakers like money, etc. in case more than one player qualifies). Overall, I was very impressed with Istanbul – it has simple rules and a relatively short playing time of 45-60 minutes, but the game still delivers an unusual and interesting game mechanic as well as a lot of short-term planning decisions. I felt I could plan ahead but didn’t feel I had to have a master plan for the long-term. As a result, I felt I was making a series of smaller, short-term plans and working out how to achieve them before needing to work out the next plan. This really satisfies my game playing style as I’m not the best long-term planner – I can do it (and am good at it in some games) but I usually prefer games where you have the option to work things out in smaller chunks as you go. That said, there’s still the opportunity to make longer plans in Istanbul if you want to. Circumstances can change as other players take items you were aiming for, or are present where/when you don’t want them, and thereby increase the costs of what you wanted to do. So, you can (and need to) plan ahead but you still need to think on your feet too to react to what’s happening around you. Each player’s turn is very short so there’s little downtime. Whilst the interaction is indirect, it does feel like you’re playing against the others, and there’s often a feeling of tension that another player is about to take what you want, or alter the prices you were relying on in a bad way. The more players there are, the more you can be affected between turns. Whilst turns are short, you can achieve a lot in a few turns, so I felt I was always making a good amount of progress each turn. I like how the ‘board’ can be laid out differently because it’s comprised of 16 tiles. Whilst there’s variety in replay by having a random layout, what really makes this strong is that there are different pre-set layouts in the rules which means you can knowingly choose the difference the layout makes to the game’s challenge. I really enjoyed the rich and dense gameplay in Istanbul, and the other players I played with (all experienced gamers) felt the same. So far, this is may favourite of the Kennerspiel nominees; of course, that has no relation to whether I think it will be selected by the jury as the actual winner, but I would if it was me. 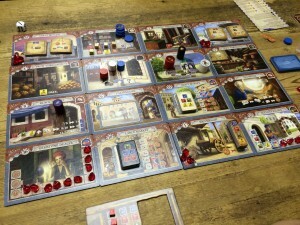 This entry was posted on Wednesday, May 28th, 2014 at 3:17 pm	and is filed under Board Game Review, Board Games, Istanbul. You can follow any responses to this entry through the RSS 2.0 feed. You can leave a response, or trackback from your own site.